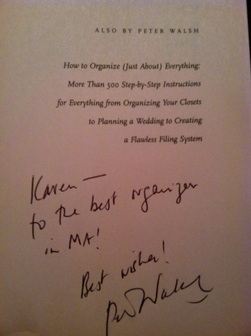 A note from organizing guru, Peter Walsh, of the Oprah Show and TLC's Clean Sweep! The number one comment I receive from my clients is that I am so fast and efficient and that they can't believe they actually enjoyed the process! I worked with Karen on two occasions - once to organize my basement and a second time to organize and file papers ranging 5 years! Both overwhelming projects! Karen is, simply put, amazing and here's why: She arrived on time. (I've worked with an organizer who always arrived late!) She was fast (pretty unbelievable what she can get done in a matter of a few hours. You have to experience it, to comprehend it). Dear Karen, thank you so, so, so much for my new kitchen!! The entire experience was so positive! A sort of purging took place yesterday, thanks to you.